This outpost of Orthodoxy benefits from a dramatic natural setting. At the beginning of the 20th century, the Russian chemist and photographer Sergei Prokudin-Gorsky developed a complex process for vivid, detailed color photography. His vision of photography as a form of education and enlightenment was demonstrated with special clarity through his photographs of architectural monuments at historic sites throughout the Russian heartland. The year 1909 was particularly significant for his work. In May, Emperor Nicholas II invited the photographer to the imperial residence at Tsarskoe Selo to show his images of Russia through an elaborate projector. Following this presentation, Prokudin-Gorsky gained the support of the imperial court to continue his travels. The august patronage accelerated the pace of the photographer’s work. Among his expeditions in summer 1909, Prokudin-Gorsky embarked on the first of his journeys to the Ural Mountains. Traveling with the logistical support of the Ministry of Transportation, he took views ranging from wild nature to large factories. My own visit to this area occurred exactly nine decades later, in late summer 1999. 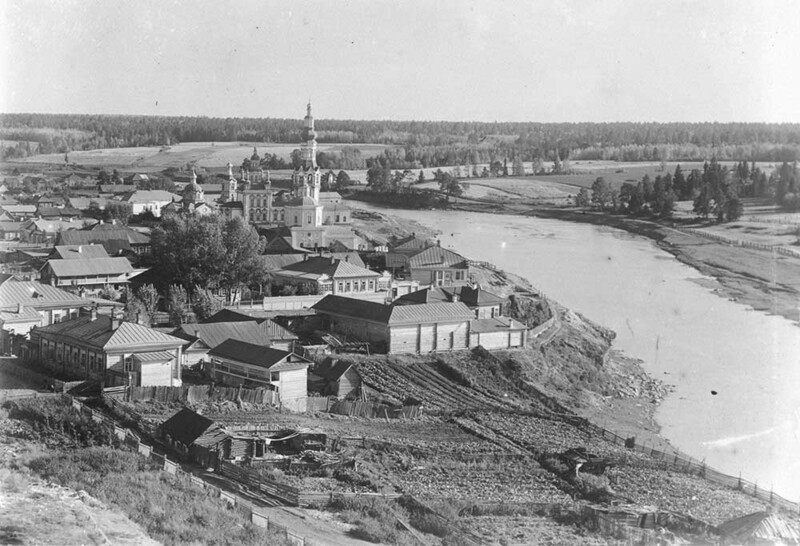 One of the most picturesque sites Prokudin-Gorsky visited in this region was the small town of Verkhoturye (pronounced “verkho-tUr-ye”), on the upper reaches of the Tura River some 185 miles to the north of Yekaterinburg. Unfortunately, the original glass negatives from this journey have not been preserved, but contact prints from his albums at the Library of Congress allow us to see these remarkable images in black-and-white. With its fortress spectacularly situated on a sheer stone cliff above the rocky Tura, Verkhoturye (its name means “upper Tura”) played a critical role in extending Russian authority to the east during the 17th century. With a current population slightly under 9,000, its modest size belies the fact that for much of the 17th and 18th centuries Verkhoturye was the primary point of transit from European Russia across the Ural Mountains into the vast Siberian domains. Around 620 miles in length, the Tura River is not large by Russian standards, yet it is a crucial link from the eastern watershed of the Urals to the great Ob-Irtysh river basin in Siberia. 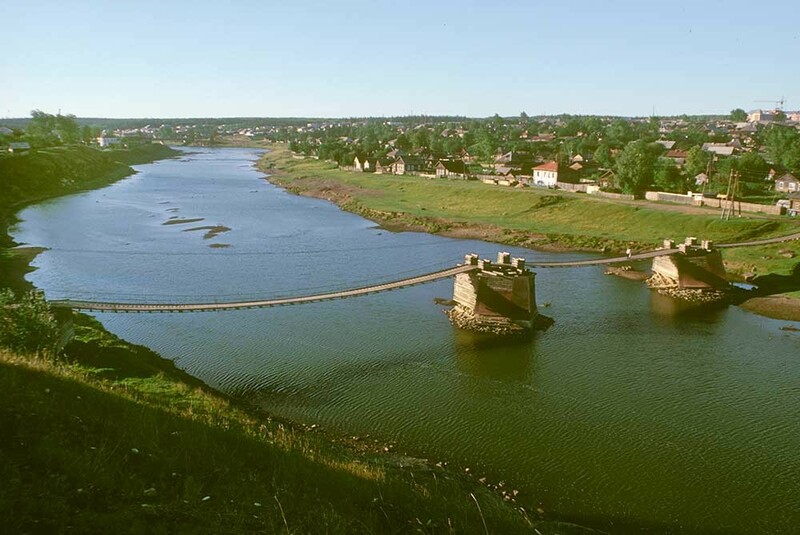 With the founding of Tobolsk in 1585, Russia had a strategic anchor on the Irtysh River in western Siberia. In 1595, Tsar Fyodor, son of Ivan the Terrible, announced a search for new paths to Siberia. The challenge was to find a more direct way across the Urals to the Tobol River basin. The Tura, which flows into the Tobol River south of Tobolsk, proved the logical choice. Shortly thereafter Artemy Babinov, a free peasant from Solikamsk, blazed a trail across the Urals from Solikamsk to the Tura River. Within a short period of two years, the almost 160-mile path was improved to a state tract that led to the fortified settlement of Verkhoturye, founded in 1598. In the same year, a log Church of the Trinity was built at the fort, one of the earliest churches in Russia’s Asian territory. Shortly thereafter Verkhoturye was designated the primary customs point for passage to Siberia. This tight control on movement to and from Siberia allowed the state to maintain its revenues through taxes on goods such as fur pelts — most especially the highly valued sable. Indeed, the ancient town shield, officially confirmed in 1783, contains a standing black sable. The Verkhoturye area also became a center of boat building. 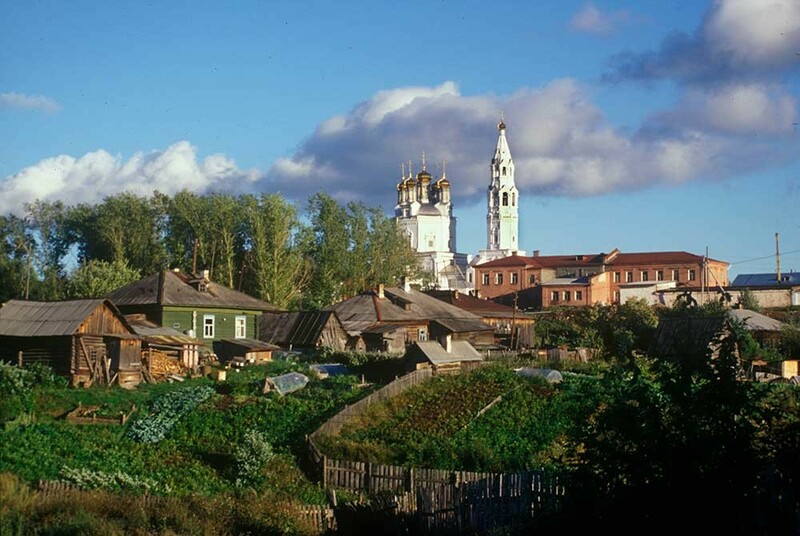 Throughout the 17th century, Verkhoturye bustled with activity as salt, manufactured goods and other essential items were shipped to new settlements in Siberia, while a flow of fur pelts made its way back toward Moscow. This “black gold” was so valuable that a separate fur treasury was created, which enabled the pelts to be carefully guarded and assessed. In addition to the settlement of townspeople adjacent to the fort, other quarters were established in the early 17th century to keep goods moving under the most difficult of conditions. Settlements on both sides of the river are linked by a suspension footbridge, seen in one of my photographs. For the first century of its existence Verkhoturye consisted entirely of wooden buildings. The beginning of the 18th century witnessed the rebuilding in brick of the fortress, strikingly located high above the Tura River on a massive outcropping named Trinity Rock after the church, now elevated to cathedral status. No longer needed as a fort, this central ensemble became a symbol of authority, with fanciful brick decoration reminiscent of the Moscow Kremlin. 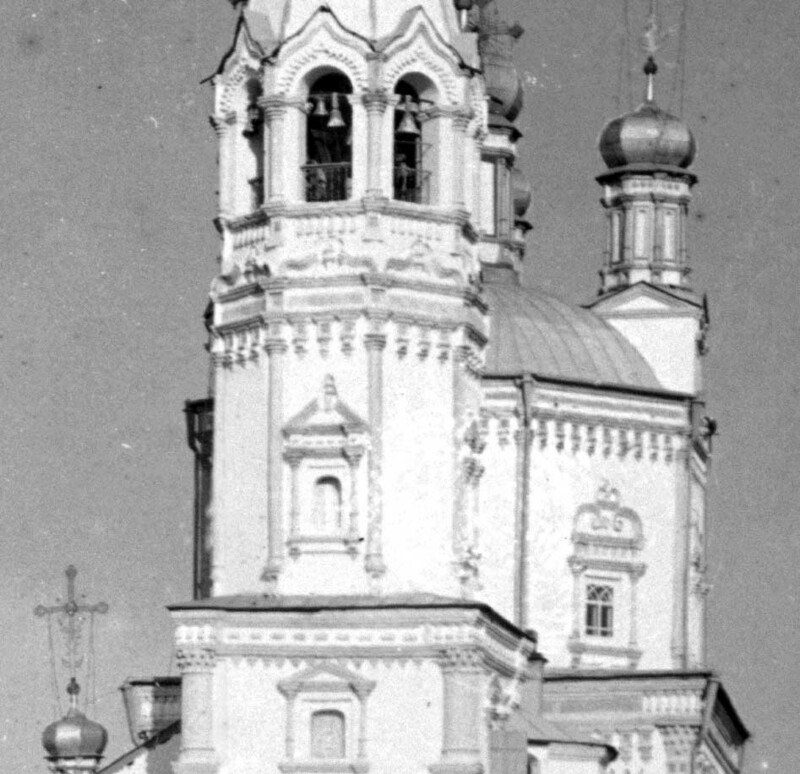 The centerpiece was the Trinity Cathedral, whose reconstruction in brick was authorized by Peter the Great in 1703, the year of the founding of St. Petersburg. The main altar was consecrated in 1709, although work on the complex structure continued until 1712. 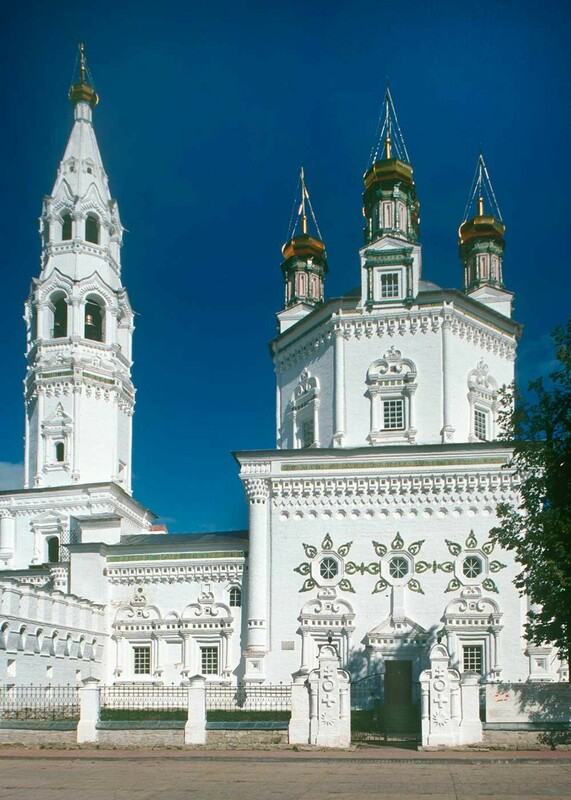 Its distinctive decoration owes much to the master builders of Solikamsk who were sent by Peter to erect an imposing structure to the glory of Russia. The Trinity Cathedral emphasizes its spectacular location with a vertical emphasis created by a high octagonal upper tier. The square basic structure is amplified by attached chapels and a large apse on the east that contains the primary altar. The bell tower soars in a spire at the west end over the main entrance. The images in Prokudin-Gorsky’s contact albums reveal his fascination with the central Verkhoturye ensemble. One view from the west encompasses not only the cathedral and bell tower, but also the attached decorative fortress walls. Among my photographs is an almost identical perspective, illuminated by the setting sun. 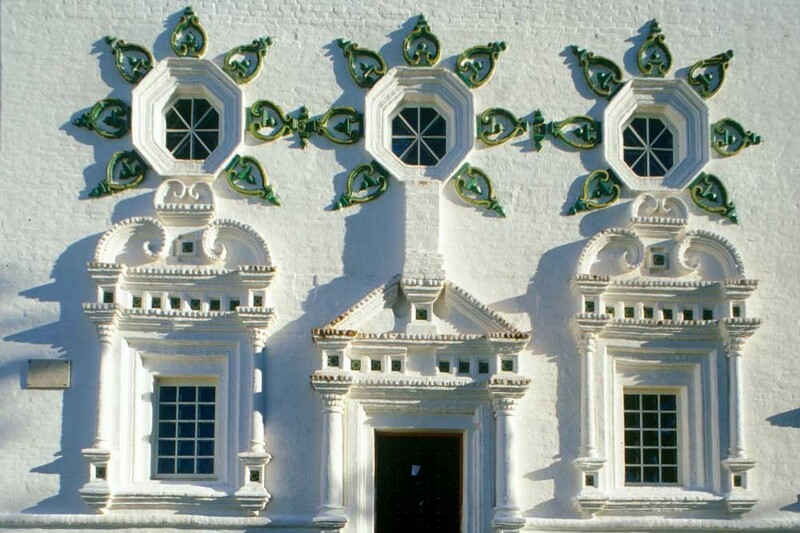 The Russian flair for ornamentation is evident in the festive ceramic work on the cathedral facades. Although we lack Prokudin-Gorsky’s negatives, which would allow a recreation of the colors as he saw them, his contact prints reveal the decorative patterns. My views with a telephoto lens capture polychrome ceramic details on a whitewashed stucco surface. 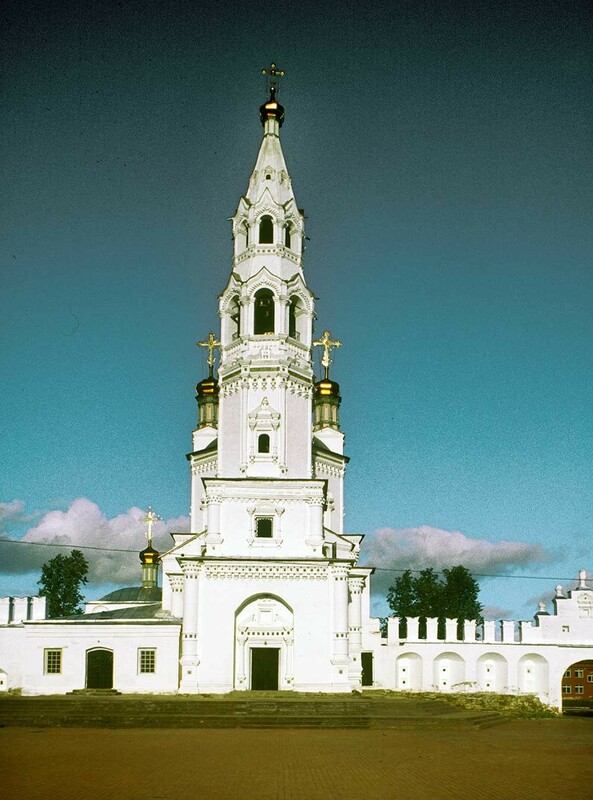 Prokudin-Gorsky also used the cathedral bell tower to take a stunning view south with the Tura River and the Intercession Convent, founded in 1621. 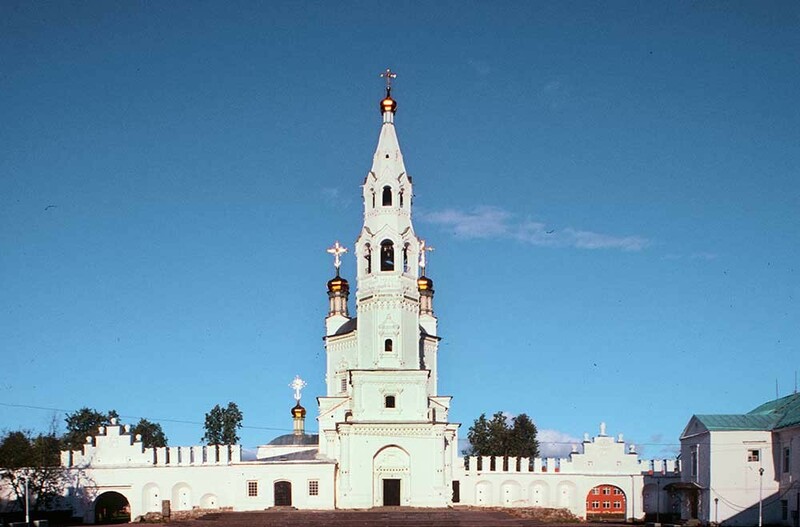 Despite its decline when the main route over the Urals to Siberia shifted southward to Yekaterinburg in the 1760s, Verkhoturye remained an important religious center, whose churches and monasteries received numerous pilgrims. 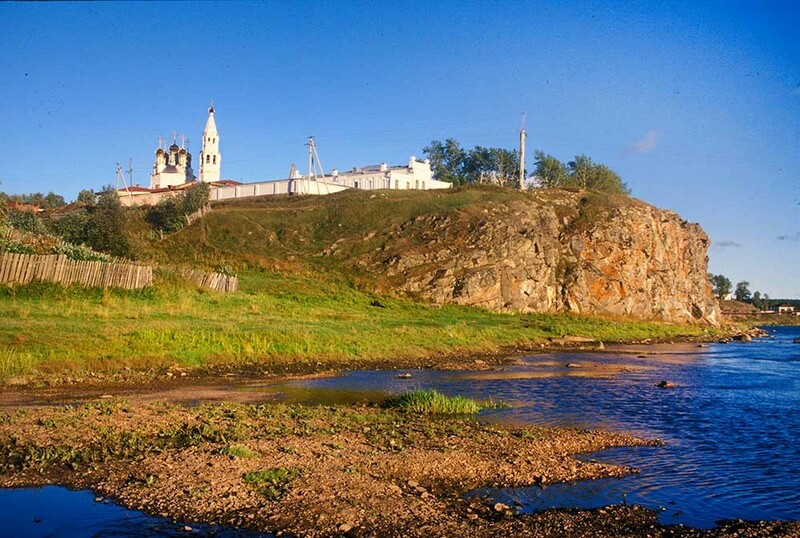 One of the reasons for this status as a pilgrimage center was its connection with the 17th-century local saint Simeon of Verkhoturye. 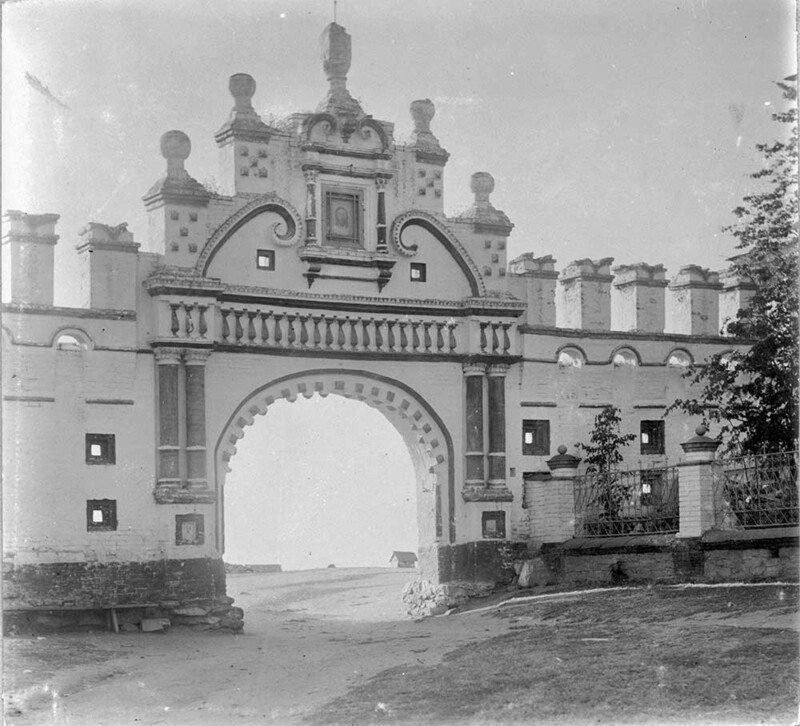 Nicholas II was especially interested in the saint’s veneration at the Verkhoturye St. Nicholas Monastery, which Prokudin-Gorsky photographed in detail. This will be the topic of a subsequent article. The Trinity Cathedral was closed in 1932 and ransacked. 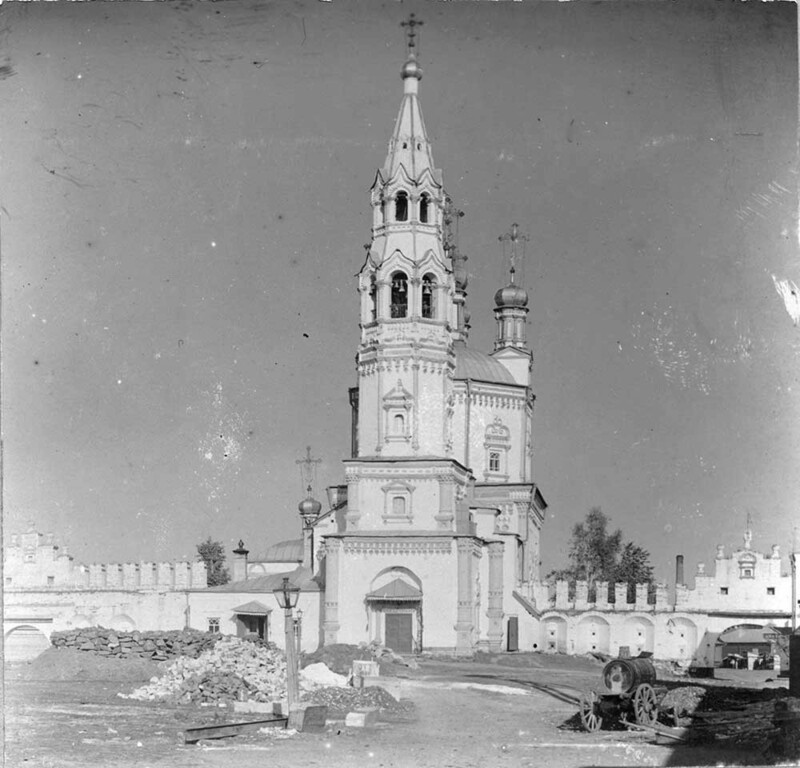 Other churches were also closed during the Soviet period, and the town became a center of Gulag administration, including a large network of forest camps that exploited the labor of thousands of prisoners. Although Trinity Cathedral received landmark status in 1960, little was done for its restoration until a superb campaign in the 1990s. In 1998, services resumed in the cathedral. In recent years, Verkhoturye has made progress in moving beyond its difficult past and economic depression. 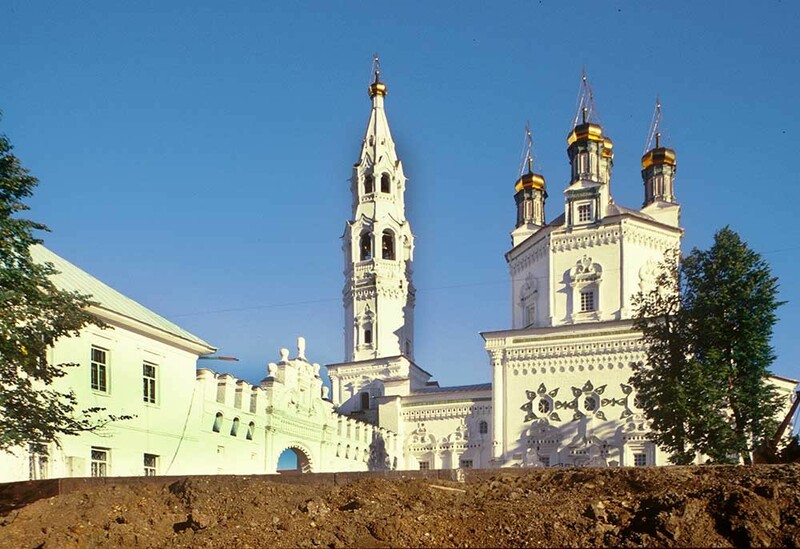 With the support of the regional administration and the Orthodox Church, historic ensembles have been restored in this dramatic natural setting.